Home » Copycat Restaurant Recipes » The Palm Steak a la Stone – Serve a delicious steak at home. The Palm Steak a la Stone – Serve a delicious steak at home. You don’t have to leave home to enjoy a good steak. 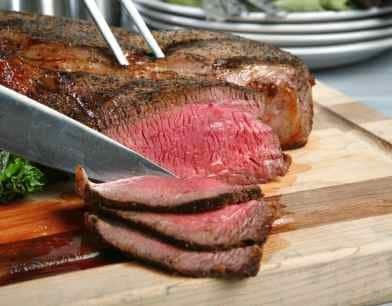 Sirloin steak is a less expensive cut of beef that you can enjoy at home. This recipe adds a special sauce flavored with onions, pimientos, butter, and fresh parsley. One secret we will share with you is to search out and buy a better cut of meat. If you can by a choice grade of meat instead of select. These have more fat in them, and tend to be more tender. Why not bring out the fancy dishes, and enjoy a steak night at home, we give you the recipes that taste just like they came from a steakhouse. Serve a delicious steak at home. Preheat broiler. In a frying pan, sauté onion and whole pimientos in butter and a touch of olive oil. Sauté for 3 minutes. Put aside while you broil the steak. When it is done, slice at an angle and place on toast. Spread onions and pimientos on top. Pour melted butter and parsley over that. This was good I would not have thought of putting pimientos on steak. It turned out really good! I will be making this again!